Advanced ceramics were developed over the years to suit particular needs that could not be met with traditional ceramics or metals. Most advanced ceramics are utilized for a particular property but it is their overall performance in many categories that make them so useful for the most demanding applications. For example; TZP zirconia is very strong under compression but the fact that it polishes well and has very high fracture toughness makes it an ideal candidate for ball bearings. The image below is a TZP zirconia ball ground to a mirror finish. Strength: the graph below illustrates the relative bending or flexural strength of several different materials. 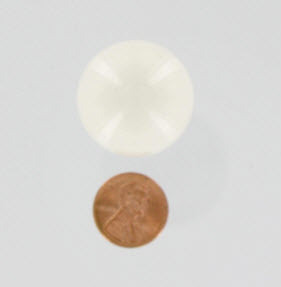 Cordierite and Steatite are ceramics commonly used for insulators but they do not exhibit the kind of strength exhibited by advanced ceramics like 99.7% alumina and 3% YTZP zirconia exhibit. 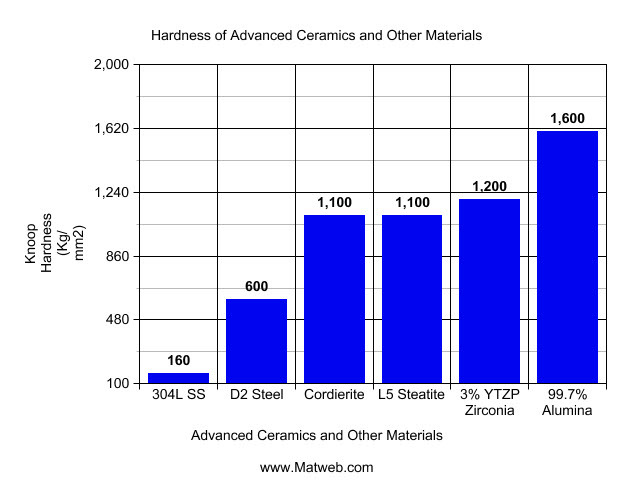 The 304L stainless steel and D2 tool steel have decent strengths but far from that of advanced ceramics. Heat Resistance: the graph below illustrates the maximum use temperature of the same materials from above. 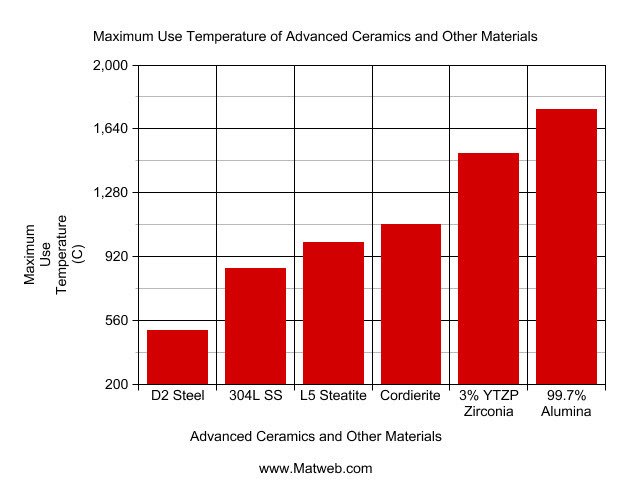 Again, the Cordierite and Steatite can withstand high temperatures and still function but nowhere near the temperatures of the advanced ceramics alumina and zirconia. Steels again fall far short of the ceramics. Hardness: the graph below illustrates the hardness of the same six materials. 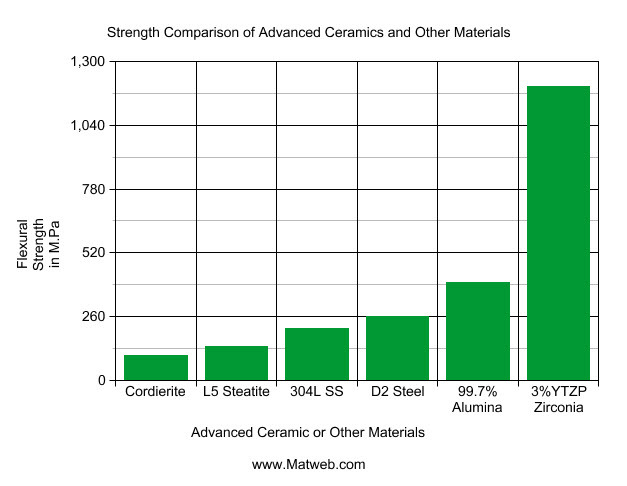 Once again the advanced ceramics alumina and zirconia are superior. Cordierite and Steatite are decent. The steels fall far short again. Density: the graph below illustrates the density of the same six materials. The density or mass per unit volume can be particularly important when designing components in assembly with moving parts or replacing an existing steel part. 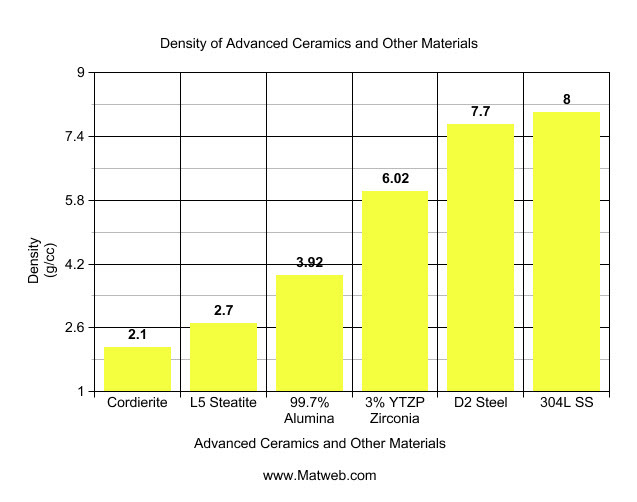 As you can see the ceramic materials are less dense than the steels; cordierite and steatite being the least dense. These are just some of the properties exhibited by advanced ceramics that make them so attractive to designers and engineers. The combination of strength, hardness, high use temperature and low mass make advanced ceramics ideal for demanding applications in almost any industry. If you have any questions or would like properties for a specific material please use the link below to contact us or call us at 770-667-8632. We would be happy to answer your questions.